If you asked a four-star restaurant to prepare a fine meal for your dog, they might come up with a recipe as good as Fromm’s Four Star Nutritionals. The Four-Star product line offers the highest inclusion levels of fresh meat, fruit, and vegetables of any dog food on the market. And it’s prepared it in a manner befitting a fine, four-star restaurant. 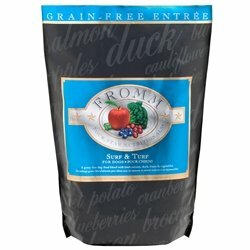 Each of Fromm’s Four-Star products uses the finest ingredients possible and is prepared in small batches. Few people take as much time and care as Fromm does to prepare their own food. But Fromm believe it’s worth it. So will you and your dog.